Red, gold, and green mangoes harvested at Mark Suiso's Makaha Mangoes farm. The branches are heavy with ripe fruit, and Suiso gets to work. He’s already got a kiddie pool filled with ripe mangos on the back of his cart. 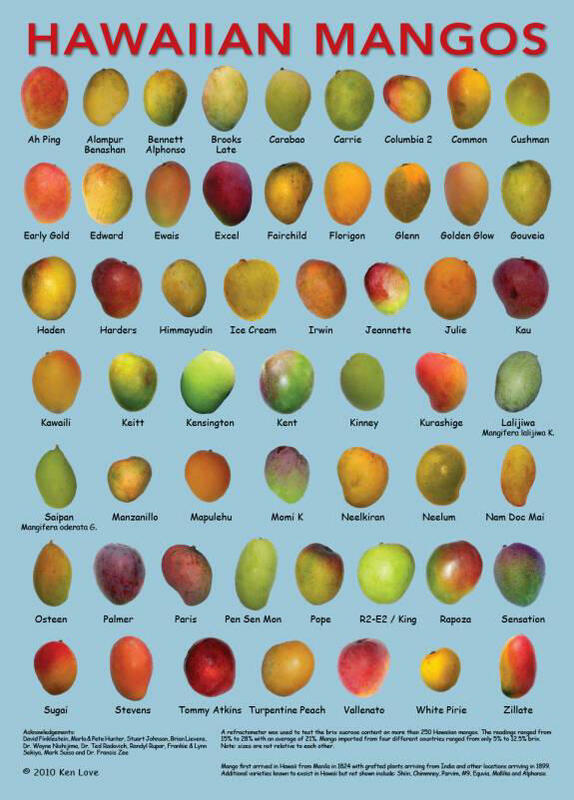 Suiso says Hawaii mangoes are much more than just Hadens and Piries. The different varieties grown on the islands now stretch into the hundreds. Horticulturist Don Marín, advisor to King Kamehameha I is credited with planting the first tree at the corner of Vineyard and River Street in the 1820s. The fruit took off and became a staple backyard crop for many local families, including the Suisos. Mark Suiso shows me around his backyard farm. Many of the trees were started by his father more than 50 years ago. He continues to experiment with grafting and creating new varieties. Suiso says so much of growing up in Hawai‘i is growing up with mango. As a kid, he’d spend summers climbing the family mango tree, picking ripe fruit and eating it over the kitchen sink. That’s part of why Suiso started his mango farm, to revive the backyard mango. Besides being an integral part of local culture, Suiso argues there’s also a social value to sharing mango. Back in Suiso’s kitchen, he pulls out a paring knife and washes the sap off a medium-sized mango that’s just turning a shade of red-orange. This one’s the Exel, an award winning fruit that took top honors for best mango two years in a row at the Mangoes at the Moana event in Waikiki. “Try this,” Suiso said, hanging me a plate of juicy, golden slices. Simple, sweet, and slightly chilled. Suiso’s right—nothing beats it. This weekend Hawaii’s new wave of cacao lovers will descend on the Chocolate Festival at Dole Cannery. Hawaii is the only state in the country where cacao is produced from seed to bar. HPR’s Molly Solomon spoke with a local business that’s seeing the sweet return on keeping chocolate local.